Given that the landscape of the Pac-12 has changed so dramatically it’s worthwhile to dive into the schedule and attempt to project the teams that will present the stiffest tests for Oregon. We lost to Washington State at home last year but so far this year they look like a train wreck. The teams at the bottom of the Pac-12 (Colorado, Oregon State) look like they will stay there. The Cal Bears meanwhile looks destined for another roller coaster season with a fine balance of wins and losses resulting in mediocrity, a hallmark of Cal football. We have only two-weeks of real data to go by but let’s take a look at the top tests of the 2016 season, here goes. I put this test first for a very simple reason, it’s the next one on the schedule. The Oregon Ducks have a new quarterback, new defensive scheme, several new coaches and a ridiculous amount of youth throughout the defensive front seven. Notice I didn’t say talent, I said youth. No doubt many of them are talented and will develop into fine defensive players. But their collective lack of experience is, for now, the defining characteristic – and it has showed during the first two games of the season. The defensive lineman are frequently failing to get off blocks making life more difficult for the linebackers. The linebackers meanwhile are frequently out of position and fail to wrap up on tackles. These two issues, among others, have led to success running the ball for both UC Davis and Virginia. I said on Twitter and will state here again, if both teams had simply stayed dedicated to the run, then both games would have been even closer – and that’s a bit scary. 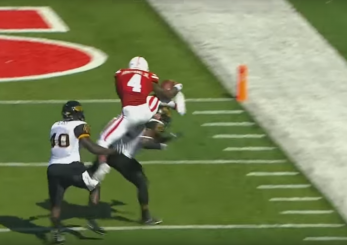 Tommy Armstrong Jr. hurdles a Southern Mississippi defender. Lincoln, Neb., will be loud, but that’s not what I’m worried about. The Oregon offense has been pretty good thus far, and I expect continued incremental improvement. What I’m worried about is the Ducks defense, because frankly it takes longer to improve on that side of the ball. Offense is mostly about timing and speed. Defense is more instinctual, more reflexive, a reaction to the play that must be felt as much as seen. And that’s what takes time they don’t have, because the Ducks will be in Lincoln this week. As you’ve probably read elsewhere the Cornhuskers offense has been on fire thus far, beating Fresno State easily by running on 51 of 64 plays for 292 yards. The following week they put up 412 in the air against Wyoming with their backup playing the final two series. Tommy Armstrong, Jr. is a dual threat that is going to be quite the test for the Oregon defense. So far this season he has thrown for 485 yards and four touchdowns with only one interception. He has also run for three touchdowns. Every year before the season I pencil out expected wins and losses, and I have an “L” next to this game. I hope the Ducks defense can slow the Huskers and get some turnovers that make the difference in the game. But being realistic, especially after the first two games, one has to admit that a loss is very possible, if not probable. 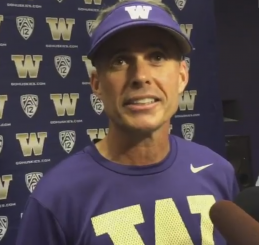 Washington head coach Chris Peterson led his team to seven wins last season, including a bowl win. The Huskies are my second test because they have a returning quarterback with experience, Jake Browning, otherwise I’d be talking about either USC or Stanford in this position. Browning has looked really good so far this year with 581 yards, eight touchdowns, and only one interception. Yes, we’ve defeated the Huskies 337 straight times, and yes, we hate them, and yes, the Ducks play them at home. They even beat them last year when their defense was supposedly dominant. Well, their defense will be good once again, and their offense has another season together under its belt. This game will be close, because their defense will have some success in slowing our offense, and their offense is going to have success against our defense – simple as that. A single turnover might be the difference in this game. Like in past years against good teams the Oregon defense will need to stiffen in the red zone and force field goals, while the offense won’t be able to afford any long stretches of drives ending in punts or turnovers. They must sustain drives and come away with points on nearly every possession. Recall that last year Oregon beat them by only six, 26-20. This year we’ll beat them again as their defense simply won’t be able to get enough stops against our dynamic offense. It’ll be close but we’ll extend our win streak to 13 straight games. Christian McCaffrey finds the end zone against the Ducks. Stanford is third because of their coaching staff, Christian McCaffrey and the fact that they’ve been at the top of the Pac-12 for the past several years. For that reason, they edge out USC and Utah. Let’s be honest, last year we got lucky. We scored just enough points and Stanford made just enough mistakes for us to win. If they had one fewer turnover, its likely they would have won. Don’t get me wrong, it was a sweet victory, but I put it down more to their mistakes than Oregon successes. My prediction is that McCaffrey is going to go off in this game, like 300+ total yards of offense and several touchdowns. They will have success early running the ball and they’ll just keep feeding him. By mid-November, however, our offense is going to be likewise unstoppable, thus the onus will be on Stanford. It will be a track meet. The boys of Track Town, USA, better show up and be prepared to score a ton of points to pull out a win. 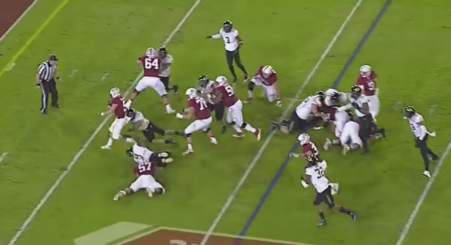 Last year the Ducks won, 38-36, but Stanford had a chance to win it at the end. This year may once again come down to the final play. This year they are without Kevin Hogan however and that will give us the edge; Ducks win in overtime on a field goal. I’ve got two teams battling for the fourth slot, because we simply don’t know enough yet about either team. USC has a newish coach and a freshman quarterback, but as usual, they have some of the best talent in the country. Utah, meanwhile, has been on the rise since joining the conference in 2011. Last year Utah destroyed the Ducks at Autzen Stadium. They were Ohio State and Oregon was a high school football team. The Utes took the ‘Oregon way’ and shoved it down our throats, defeating us in every aspect of the game. The Ducks lost, 62-20, but it wasn’t even that close. Utah, however, lost its top two quarterbacks, its top running back, its top three receivers and their three-year starting center - ouch. For that reason, I’m going to give USC, whom we play on the road this year, the nod for fourth place. We’ll know more about how challenging they will be as the season progresses. I’m still picking the Ducks in both of these games however because as long as we play mistake free football our offense is not going to be stopped and as our defense matures throughout the season teams will not be able to keep up with our scoring. Kalen Ballage runs through Tyree Robinson in a triple overtime loss in 2015. The Sun Devils will be Oregon’s sixth-most difficult test of the 2016 season. Have you seen their offense? It’s crazy, ridiculous, stupid good. I need an automatic superlative generator for this paragraph to attempt to describe it. I know Texas Tech is devoid of defense but 68 points? I know ASU also gave up 55 points to the Red Raiders … but 68 points? ASU running back Kevin Ballage had eight touchdowns! EIGHT! You might not remember since the Ducks gave up 742 yards (no, that’s not a typo), but last year Ballage averaged 10.6 against the Oregon defense. This year will be another test for the defense, no doubt about it. It makes the Top 6 board simply because of their offense. The Ducks offense should be really good by the end of October, and Oregon gets them at home, but holy moly, we’d better be ready to score a ton of points. In keeping with Arizona State Sun Devil tradition they will find a way to royally screw up and we’ll win a high-scoring affair at home. 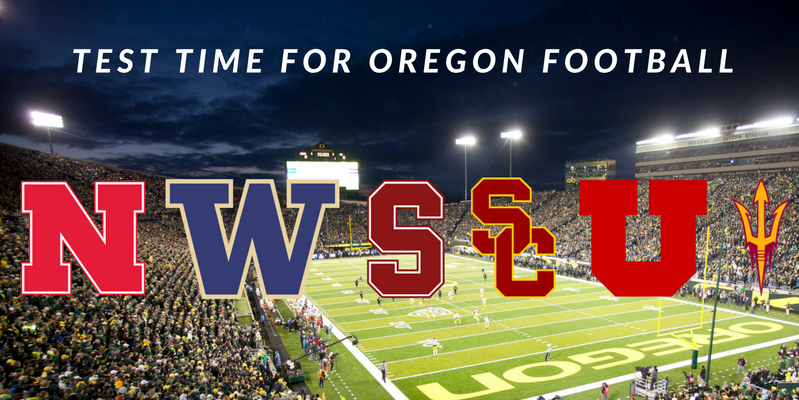 Mark these games on your calendar, because in one way or another they will test this 2016 Oregon Ducks squad. Given only what we’ve seen thus far, I’m predicting wins against Colorado, Washington State, California and Oregon State. If you’re keeping track that means I’ve just predicted an 11-1 season, with our only loss at Nebraska. Even if we lose the other top two tests (Washington and Stanford) we’ll still be 9-3 and likely playing in the Alamo or Holiday Bowl, not bad considering how many times the revolving door has swung in Eugene this year.